Walk through Clapham Junction in South London, and you might catch a whiff of something heady, but rather fragrant. The scent, it transpires, is white tea and thyme. 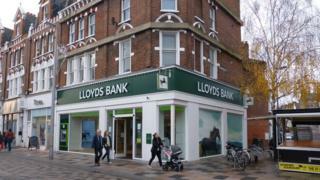 And it is coming from a new branch of Lloyds Bank. "It gives that inviting feel, that welcoming feel," says the building's designer, Sarah Harrison. "You can smell it on the High Street when the wind's blowing in the right direction." Lloyds is not the first bank to spot the possibilities of sensory attraction. Across the Atlantic, one bank offers its customers freshly brewed coffee, using the nutty aromas of Arabica to entice new followers. In fact rather than banks, it calls them cafes. In the UK, High Street banks are set to close hundreds more branches in 2017. Nevertheless, with ideas for alluring new formats, the industry believes that the concept of branch banking at long last has the whiff of something positive about it. Hence they are investing millions of pounds in makeovers. In fact, in 2017 at least three British banks will open more branches than they will close. When the US firm Capital One launched a digital-only bank, it thought it would never have to go to the expense of building any branches. But seeing that customers wanted a more physical relationship with their bank, it changed its mind. Now it has 13 banking "cafes" across the US, where a cup of coffee is half price for those who pay with their card. Account holders can also enjoy a freshly baked muffin, or tuck in to as many bytes of data as they wish from the free wi-fi, as they do some online, or face-to-face, banking. "We had a digital bank, and we needed to connect with the communities that we serve," says Shaun Rowley, director of Capital One Cafes. "These cafes give customers a chance to come in, and experience our brand: see, touch and taste Capital One." He describes the branches as "more cafe than bank", but promises that customers can do any financial transactions they would normally expect. "There are a lot of banks experimenting with different formats. There's all sorts of transformations going on," he tells the BBC. Among those impressed by the Capital One cafes is Jakob Pfaudler, the chief operating officer of Lloyds Bank's retail division. "There's a bunch of beautiful stores over there, where you really have the human touch, combined with quite heavy digital content. I think that is our mental model," he says. In 2017, Lloyds is planning to close another 200 UK branches, following a similar number in 2016. But it will also build some new, large ones. "Yes there will be some branch closures, but what we are doing is reformatting the entire branch network over the next four or five years, and building more of the branches like the one in Clapham." One other feature of the Clapham blueprint is a giant video wall, on which customers can view house prices in nearby streets, or get property-buying tips. The aroma device is now a key part of Mr Pfaudler's thinking too. "It moves further away from the traditional, rather stiff branch environment. So, while it wasn't necessarily a design feature, I think we're going to roll this out into many more of our branches - maybe not that specific scent, although I like it." In 2017 at least three smaller brands expect to grow their network. Metro Bank - which opens its latest branch in Basingstoke on 31 December - is planning a dozen new "stores" as it calls them. Both TSB and Handelsbanken will also expand their branch numbers next year. And Santander will upgrade as many as 60 branches. At a pilot branch in central London, customers can already pay in cheques and cash at the same machine they use to withdraw money. And they can receive an email confirming the transaction. The old-style counter, complete with tellers, is hidden away at the back. Uniformed customer service assistants show members of the public how to switch to the new-style cash machines. "For the customer to understand all the functionality on an ATM, to pay in a cheque for the first time, for example, they'll often need a colleague to walk them through it," says Martin Bischoff, managing director of retail distribution at Santander. If banks get this wrong, there could be trouble. The story is told by one banking executive of how a Polish online bank opened its first branch, only to find an army of customers queuing up outside - as they had just been presented with their first opportunity to complain. In case customers really lose it, another executive told me, they now plan so-called "defusing" rooms in their branches, where account holders can be taken to cool down. It's not just the branches themselves that are changing. It's their attitudes to customers. In an attempt to be more welcoming, some in the industry want their branches to feel like hotels or restaurants. "From a physical perspective, hospitality offers a very good role model," says Ray Ehscheid, senior vice president for store design at Bank of America. "If you think about a hotel experience, it can be relatively scripted: you enter, there's a welcoming experience, you're either directed to where you want to go - which might be the restaurant - or there's a check-in experience." He even refers to the front-of-house staff member as the "concierge". "Again, I would go back to the hotel experience. The doorman might be able to get you a taxi, they might be able to tell you where the nearest restaurant is, but they're going to turn you over to the concierge if you say you want a particular kind of dining experience. So we want to have that same idea." But one expert warns about being too free-thinking with branch design. Marcus Pequeno, a Spanish banking consultant, remembers the case of a South American bank wthat decided to offer free coffee, wi-fi and soft drinks in a refurbished branch. The morning of the opening did not go according to plan. "Basically there were 100 students in front of, and inside the branch, hanging out and taking selfies," he told a conference called Branch Transformation earlier this month. "They were doing anything but banking." So don't expect your branch to turn into a coffee bar in 2017. But don't be surprised if a visit there feels better, and quicker, than it used to. With perhaps a few nice smells to enjoy at the same time.